The WB7073L1 is one of Cartier Tank's series watch. The cute wristwatch that is designed for women. 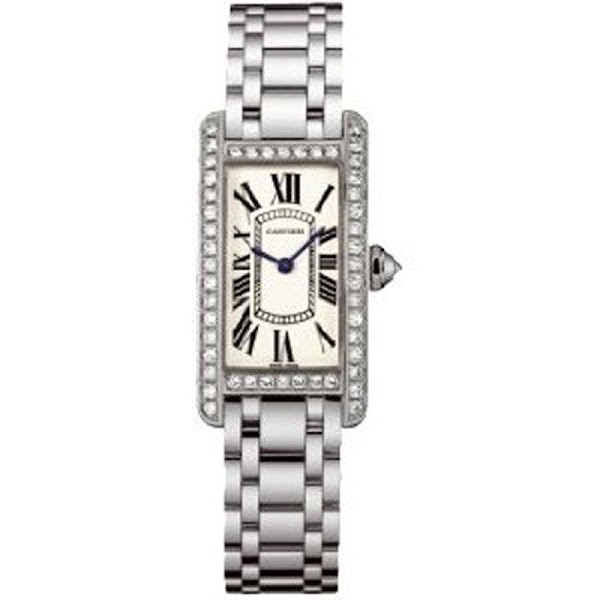 This American Ladies Watch has an 18kt white gold case with an 18kt white gold link bracelet, a fixed 18kt white gold bezel set with diamonds, a silver guilloche dial with blued steel hands and black Roman numeral hour markers. Minute markers around an inner ring. Scratch resistant sapphire crystal. Additionally, the timepiece offers an 18kt white gold octagonal crown set with a single diamond with solid case back. Has case dimensions of 18.6mm x 34.8mm with hidden deployment clasp. Powered by Quartz movement and is rated water resistant up to 30 meters / 100 feet. Cartier WB7073L1 Watch's original price $33,875. You can find an original Cartier WB7073L1 Watch at the site(s) listed above. However, we don’t guarantee its availability as being listed here simply means that those site(s) has the item in question by the time we wrote the review.